Up until a few days ago there was no rating on Whiskybase for this Caol Ila but thankfully someone came to my rescue with a stunning 90/100. The tasting notes on the bottle read “honey glazed ham and boozy grilled pineapple. The taste is an explosion of peat smoke and brown sauce served with fish and chips. With water, smoked scallops and a peat smoked pineapple soufflé.” Sounds lovely! Although Jim Murray doesn’t mention this exact Caol Ila 19yo in his Whisky Bible 2016 he does include 9 bottlings by the Scotch Malt Whisky Society (SMWS) including four 18-year-olds. This is a similar maturity to my 19yo sample and their scores range from 85.5/100 to 91/100, which is excellent news. Of the 9 bottles the lowest mark is 81/100, which is still “good whisky worth trying” according to the book’s score chart. This might not seem 100% relevant since every whisky is different but it lets me know that those within the SMWS that taste and select Caol Ila casks for bottling are consistently good in the eyes of Mr Murray. I’ve yet to taste a bad Caol Ila and this sample isn’t likely to change that fact. Now, where’s my glass….. In the Whisky Bible 2015 the previous ‘Distillers Edition’ 2000/12 scores an amazing 95/100. It also scores 86.13/100 on Whiskybase from 54 votes. 84.67/100 for my bottle is a bit of a slip but both are the same age, strength and double matured in Moscatel cask wood. You’d expect a lot of similarity between the two releases and clearly the quality is kept high for this delightful Islay single malt. I was hoping to pick out some interesting comments from the reviews on Whiskybase but the majority are in German. English comments about the taste include “peat, chocolate, salt, liquorice, toffee, lime and peach” also “ashes, spices, some gun powder, liquorice and citrus – lemon”. Someone summarises with “nice Islay, to bad for that weak finish” although others say the finish is ‘medium’. Each to their own as usual but clearly this is a very pleasant dram. 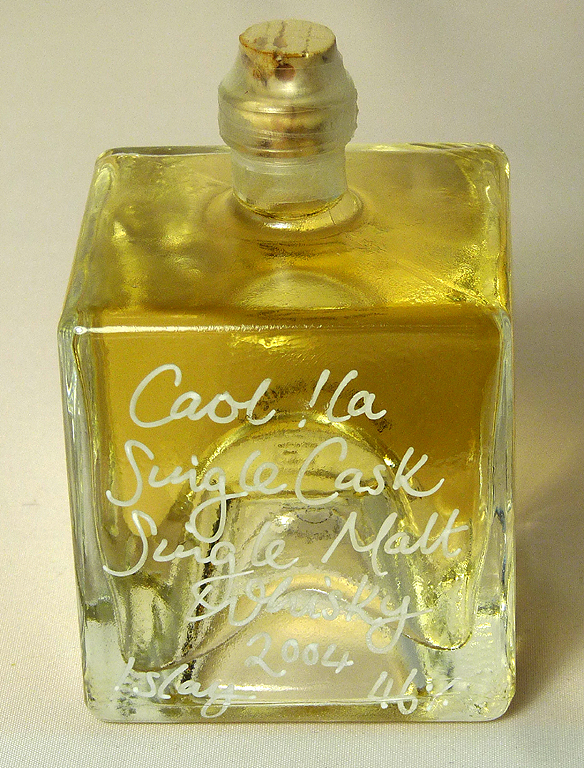 I’m beginning to think of Caol Ila as ‘the easy drinking Islay’. An Ardbeg is like Guinness, where a couple of glasses are delicious but very rich, deep and filling. Caol Ila on the other hand is like an easy-sipping beer. The whole night can slip by without you realising how many glasses you’ve had until you try and get up and your legs go to jelly. 87/100 in the Whisky Bible is excellent, and the author confirmed my view of Caol Ila by saying “Easy drinking Islay” then concluding with “though I think they mean “Mocha”.” Ralfy’s review gives an interesting summary of the flavours. If I manage to detect half of his list I’ll be happy! He thinks the Moch is mostly 7 to 8-year-old whisky. Two reviewers on Whiskybase compare the Moch to the Caol Ila 12yo saying it’s “softer and sweeter” and “more complex and more fruity” than its older brother. Whiskybase scores the 12yo 83.86/100, so almost identical to the Moch, and the Whisky Bible has the 12yo two points ahead with 89/100. Comparisons aside, the Moch sounds like a very pleasant dram.